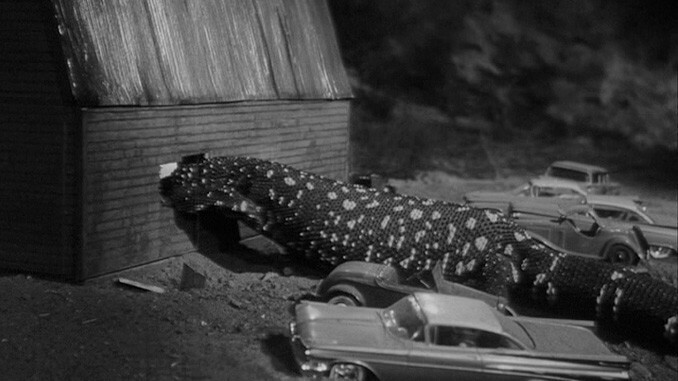 Okay, so it’s not a gila monster, it’s a Mexican beaded lizard, and yes, the special effects involving it are shoddy and unconvincing (the trainwreck is not a highlight), but The Giant Gila Monster is definitely a cult classic. With its authentic Texan locations, mutually beneficial cooperation between its teenagers and the sheriff, unexpected rendition of The Mushroom Song by Sullivan (and twice, no less), and more hot rod inspired slang than you can shake a nerf bar at, the movie has a rudimentary charm that more than makes up for its deficiencies elsewhere. The performances are perfectly acceptable, Kellogg’s direction is simple yet effective, and the script by Jay Simms ensures that the characters (mostly) aren’t too one-dmensional. 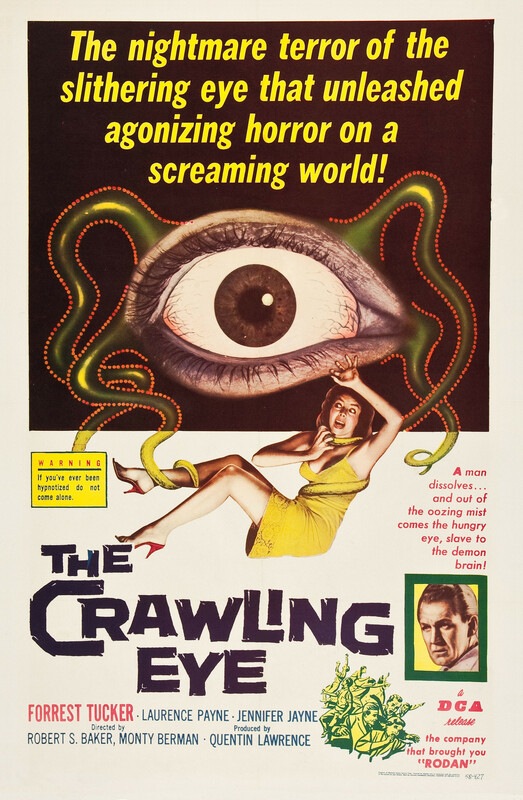 Like so many Fifties sci-fi/horrors it’s let down by the quality of its monster and the model work that surrounds it, and although this is the source of much amusement, there are sufficient good ideas present that if there had been a bigger budget, it would have meant a much more polished movie. It’s also that rare Fifties sci-fi/horror that can be watched more than once, and which remains way more superior than Gila!, the made-for-TV remake that escaped in 2012. 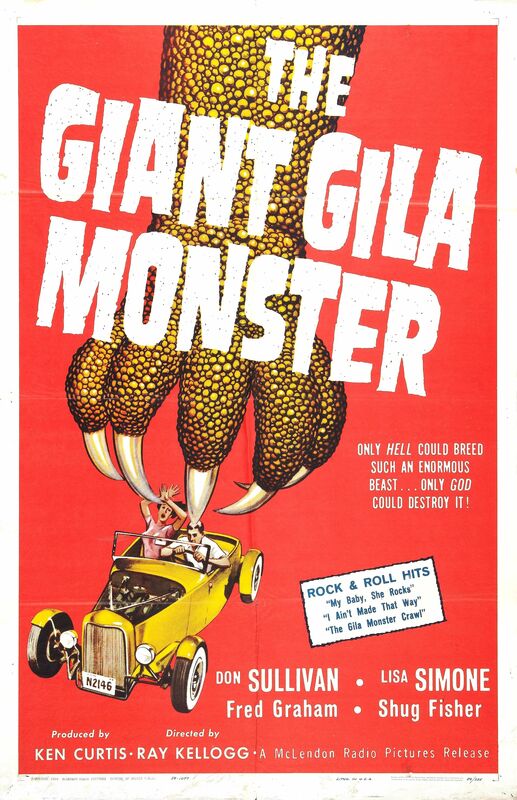 Rating: 6/10 – if you can ignore the low budget trappings, and the lack of any real threat from the titular creature, then The Giant Gila Monster is something of a pleasant surprise; almost gratuitously good-natured in its approach, this really isn’t a sci-fi or a horror movie, but it is more interesting to watch than the majority of its ilk. 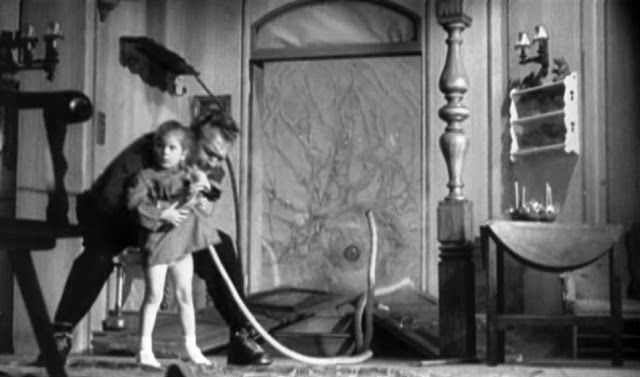 Adapted from the 1956 UK TV series of the same name, The Trollenberg Terror is a sci-fi/horror movie that does its best on a limited budget, and though some of the model effects are particularly shoddy, its alien creature is one of the most effectively designed and realised of its time (those tentacles, though!). It’s played incredibly straight throughout, with its cast seemingly banned from raising a smile unless it’s absolutely necessary (and even then, only with written permission), and the serious nature of the aliens’ threat is emphasised at every turn. However, this doesn’t stop the movie from being enjoyable to watch – in a daft, you couldn’t make it up kind of way – and the performances, though a little po-faced at times, go a long way to selling the absurdity of it all. Lawrence, whose first feature this was, shows a knack for staging the horror elements to ensure maximum impact – the opening scene is grisly without being explicit – and though this is clearly set in Switzerland by way of a studio in Middlesex, there’s a keen sense of time and place. Rating: 7/10 – let down by a final ten minutes that cruelly exposes its limited budget, The Trollenberg Terror is still a better than most example of late Fifties sci-fi/horror; apparently a partial inspiration for John Carpenter’s The Fog (1980), it’s a movie with some clever ideas, and one that isn’t afraid to throw a number of wild ones in there as well (zombies, anyone? ).